Central American migrants begin their morning trek facing Pico de Orizaba volcano as part of a thousands-strong caravan hoping to reach the U.S. border, upon departure from Cordoba, Veracruz state, Mexico, Nov. 5, 2018. Thousands of Central American migrants traveling in a caravan arrived in the Mexican capital Monday and began to fill up a sports stadium, still hundreds of miles from their goal of reaching the U.S. a day before midterm elections in which President Donald Trump has made their journey a central campaign issue. Many went to medical tents to get treatment for blistered and aching feet, illness and other maladies. "Since we got here, we have not stopped,'' said Tania Escobar, a nurse with Mexico City's public health department. "We have the space in terms of humanitarian help,'' Ramirez said. Central American migrants begin their morning trek as part of a thousands-strong caravan hoping to reach the U.S. border, as they depart Cordoba, Veracruz state, Mexico, Nov. 5, 2018. ​As U.S. election day neared, Trump has seized on the caravan and portrayed it as a major threat, even though such caravans have happened regularly over the years and largely passed unnoticed. "I looked for work, and nothing,'' Gonzalez said, adding that her husband had been robbed and had to hand over everything he made selling crabs so his assailants wouldn't do worse. "And when one does find a little job they kill you for the money,'' she said. U.S.-bound Central American migrants get on to a truck for a a free ride, as part of a thousands-strong caravan moving through Puebla, Mexico, Nov. 5, 2018. "People help more in Chiapas and Oaxaca,'' Leyva said, referring to the southern Mexican states the group had already traversed and where pickup trucks frequently stopped to offer rides. 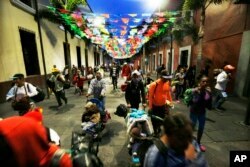 Central American migrants begin their morning trek as part of a thousands-strong caravan hoping to reach the U.S. border, as they face the Pico de Orizaba volcano upon departure from Cordoba, Mexico, Nov. 5, 2018. ​Many said they remain convinced that traveling together is their best hope for reaching the U.S.
Yuri Juarez, 42, said he thinks there's a "very low'' chance he will get asylum in the United States. But he said he had no way to work back home in Villanueva, Guatemala, where he closed his internet cafe after gang members extorted him, robbed his customers and finally stole his computers.